Sunday – Last Day to take in the 2013 Open Studio Event! I am beginning day three of this year’s Open Studio Event, and it is time to share a few images gathered between crowds. 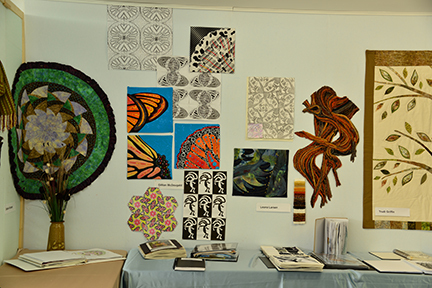 Today’s feature image above showcases (from left to right) Debbie’s circular table topping, Gillian’s in-depth study of Monarch Butterflies, Leona’s study of a bristle cone pine tree and Trudi’s quilted wall hanging. I want to thank the following design class graduates: Emelie, Kathleen, Grace, Debora, Joan, Wendy, Trudi, Leona, Gillian, Debbie, Lynn, Dorothy, Susan, Pat and Leann for following through with their commitment during the first part of 2013. Another special thank you goes to Glenda Loustel and Bill Kruse, the featured artists, for participating and supporting this year’s event. 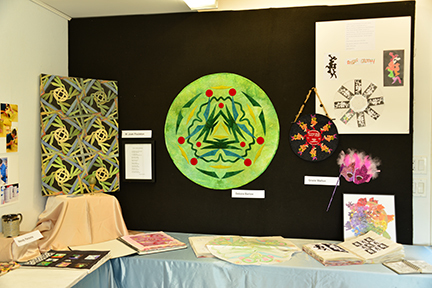 Their art work and enthusiasm has greatly contributed to this year’s event. Visitors have been coming and going ever since we opened the doors Friday at noon. Today is the last day to drop by to see the installed work, ask questions and sample some cake. Instead of a slide show I have decided to provide you with a short photo essay to share the sights of this weekend at Anna Hergert Design Studio. Enjoy! 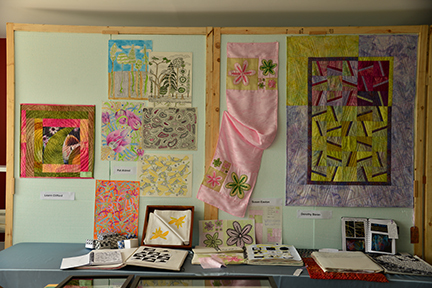 Debbie, a quilter, and Lynn, a weaver and quilter showcase their final projects. 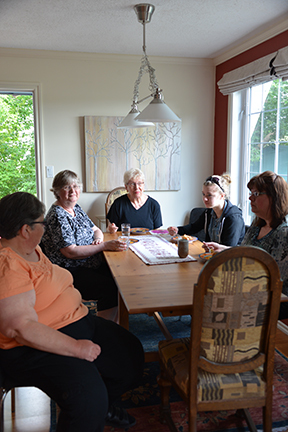 Debbie’s inspiration was mushrooms, Lynn chose to explore wetlands as her living form. Joan, a painter, created a tessellated design based on the Walla-Walla Onion. She also wrote a poem to accompany her painting. Wendy, a potter, had originally created a jug and tumbler set, printed in a counter change pattern created in class – it sold as soon as it came out of the kiln – all that was left for the exhibition were two mugs. Luckily I was at her studio the day she created the jug. I had photos to show her progress. 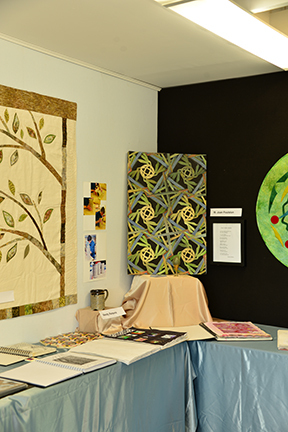 On the left is Trudi’s quilted wall hanging based on her study of trees. Debora’s circular wall hanging was based on the plant world. To the right is Grace’s “Feeling Groovy” hanging and Fibonacci number sequence based mask. 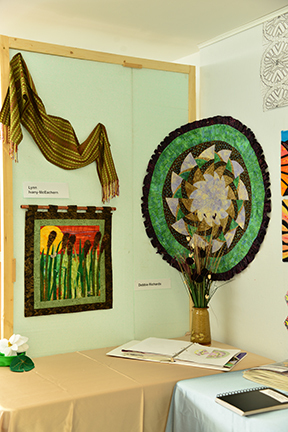 This double display wall features Leann’s Fibonacci sequence double sided quilt, Pat’s drawings and patterns based on her study based on Lilies as well as Susan’s Fibonacci based scarf and Dorothy’s Fibonacci sequence based quilt. 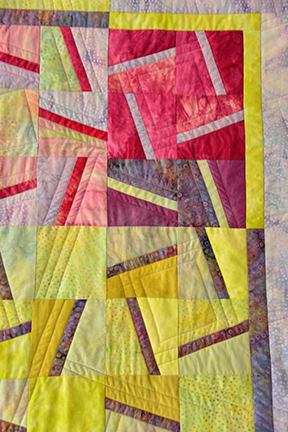 A close up of Dorothy’s crib-sized quilt. Pat created a stamp by stylizing a lily bud. 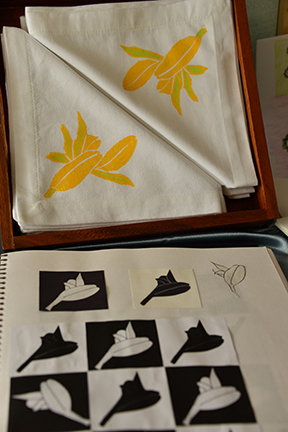 She used textile paints to stamp the design on a set of cotton napkins. 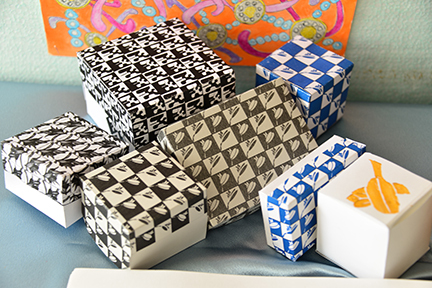 Pat created a variety of patterns, reduced them in size and fashioned a collection of gift boxes. This three dimensional double display showcased Emelie’s bags and cards. A passionate weaver Emelie created numerous thread wrappings. Her designs were based on a tropical ocean creature. On the right Kathleen’s jacket has intricate inner lining and hand and machine embellished back. Her designs are based on whales. 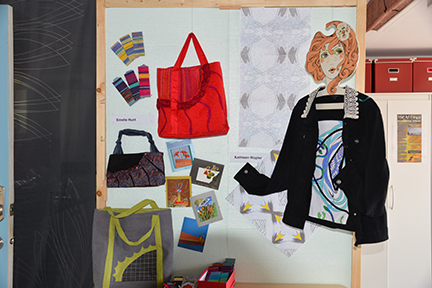 Her backdrop features two “diaper” patterns created during the workshop. 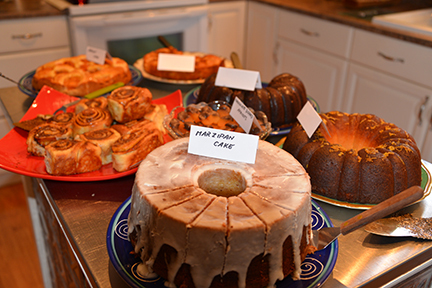 Just a few cakes and fresh sticky buns fresh from the oven! Refreshments were served all day Friday and Saturday. 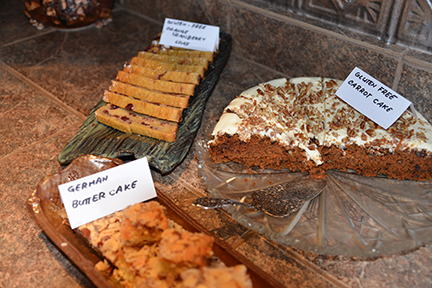 Cream cakes (not featured here) proved popular in the afternoon with coffee or tea. And those with gluten sensitivities and allergies could choose between carrot cake or orange and cranberry loaf. 23 Jun	This entry was published on June 23, 2013 at 7:04 am. It’s filed under Art, Creativity Update, Design, Exhibition, Exhibition News, In the News, Journaling, Networking and tagged Open Studio Event 2013. Bookmark the permalink. Follow any comments here with the RSS feed for this post. Over the top again Anna, I can’t get over how you even think to take pictures with all the deadlines and hustle. We love the pictures so don’t stop. Being with you would of been such a retreat but we have a huge mess to deal with in Calgary, not personally but collectively as a city. I will get involved with the Samaritan’s Purse as they go to sites and clean till it is live able. One of these years I will make it out to your Studio opening. With all the rain I haven’t put my fabrics away for a summer break. Shirley, we have been watching the horrible news about Calgary and area flooding for most of the week. Our hearts go out to our friends and family who are dealing with evacuation, from both business and homes, as well as the extensive clean up that is ahead. Your involvement in helping out with the clean up efforts really shows your selfless dedication and commitment to the city and people of Calgary. One of these years you will be able to come out to the Open Studio, meet the participants and watch everyone interact. This weekend we were blessed with warm sunshine and 105 visitors. My winter classes are nearly filled and I am looking forward to offering the Advanced Design class for the first time in Saskatchewan since I moved here. Remember, stay in touch and if you can find time think about a visit! Warm hugs to my dear friend! Congratulations on such a successful Studio Open House. Your students’ talents were lovingly shown in such different ways – so unique. Your offered refreshments and goodies would have put a severe strain on my Weight Watchers program had I been so lucky to have been able to attend! Thank you, Karen. My students (both groups) worked hard during the long cold winter and well into the spring. I was so pleased to see the show come together. About the refreshment, I always think of those that are on a gluten-free and/or calorie reduced diet – there were several options for everyone! Don’t let the cakes discourage you from attending one of my Open Studio Events in the future. We were all just ‘blown away’ by each of the projects on display, and by the sketchbooks and descriptions of their work provided by the artists. The gorgeous cakes and other refreshments so hospitably offered by Colin were a delicious highlight, and how informative and pleasant it was to speak with, and view the works of Glenda and Bill. Anna, what a lovely way to show and celebrate accomplishments of your students and artist colleagues, to acquaint visitors with your studio, and introduce them to the fibre art you do there. Thank you on behalf of us all for a most pleasant and inspiring afternoon. Judith, it was great to see and briefly visit with you. Thank you for bringing your friends – support like this is so important. Yes the day was so very interesting and well presented. I think everyone was amazed at the types of work that came from the class. I had three pieces of cake (topped with whip cream). Yikes!! Thanks, Leona! Glad you enjoyed your time here this weekend. It was great to see you and there were many wonderful comments about everyone’s work on display. Glad you liked the cakes… that is why I bake – the people who enjoy my European recipes. Hennie, I wish as well that you could have been here. The Open Studio was a great success. Lots of people, great feedback and enrollment for the introductory session in early 2014 is well on its way! What a great event Anna! The work that the students did was incredible. Each one so very different and yet all reflective of the work that they did with you. Congratulations on another successful Open Studio. Ann, thank you for making time to drive down and attend the Open Studio Event. It was great to see everyone. The comments are much like yours’ – everyone is fascinated with the individuality of each student’s presentation. I am so proud of what everyone has accomplished. Have a great Sunday!